Just two weeks ago, the world’s fiercest and fastest racing drivers returned to Silverstone for what turned out to be a thrilling British Grand Prix. While our exceptional British drivers have had mixed fortunes on the track this season, for me the return of Formula One to our shores is always an ideal opportunity to recognise British success in automotive more widely. Jumping from continent to continent Formula One can seem like a world away, but in fact we are home to 8 of the 11 teams. Including reigning champions Red Bull, most of the factories are based between West Midlands and Oxfordshire in the UK’s “Motorsport Valley”. Our prowess for car building is not just exclusive to motorsport. The automotive industry happens to be the country’s largest sector in terms of exports. 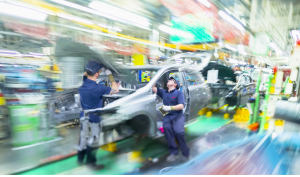 With demand from Asia, America and everywhere in between, the automotive sector employs over 700,000 people in jobs ranging from design, repair and ultra low carbon innovation. The perception that UK car manufacturing is in decline is certainly worth questioning. But, as Chair of the All-Party Motor Group (APMG) and MP for Birmingham Northfield, I know that we can’t be complacent. Protecting and strengthening the automotive sector for the future requires concerted action. This week the APMG publishes its annual report, Fuelling Ambition: Investment and Strategic Direction for UK Automotive. In it we not only recognise the success of the UK car industry as a leading location for inward investment, but outline the importance of seizing new opportunities for future growth. Formally launched in the House of Commons today, and submitted in advance to ministers, shadow ministers and the Business, Science and Treasury Select Committees, it provides a summary of our meetings over the past year, and highlights our recommendations to the Government. Central to the conclusions we drew from discussions with business leaders, academics and trade officials the need for the government to fuel the ambition of UK automotive. The forthcoming release of the Government‘s automotive strategy, which provides a comprehensive strategic framework for the industry, must now be supported with sustained investment and commitment in the long term. Overseas expansion will be crucial. The Government must focus on reducing barriers to trade and finalising priority trade deals – such as the much talked one between the US and the EU. Securing deals with emerging markets – such as the rapidly growing economies of Korea and Brazil – must also be a priority. The cross-party group of MPs and Lords also call on the Government to back research and innovation into future growth opportunities – such as sustainable technologies and evolving driver trends – with investment now. It is clear that the UK is in pole position to accelerate its growth. But as is the case in Formula One, a driver is only as good as the team around him. For the automotive industry to continue excelling the Government must continue to play a central part. For more information about the All-Party Parliamentary Motor Group click here.